EXCLUSIVE! 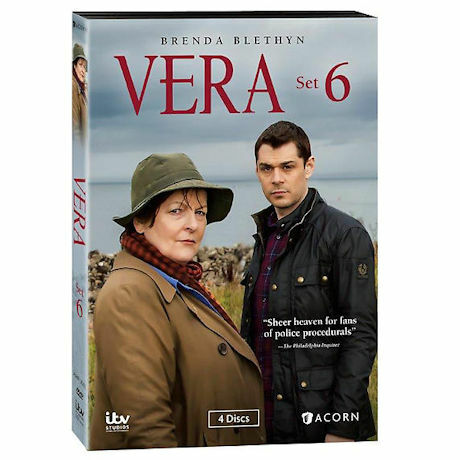 DCI Vera Stanhope (two-time Oscar® nominee Brenda Blethyn) and her sergeant, DS Aiden Healey (Keny Doughty), investigate the deaths of a grandmother found on the desolate Northumberland moors, a young man who worked at a traveling fairground, a fisherman found tangled in the nets of a North Sea trawler, and the mysterious double murder of a moth enthusiast and a 22-year-old victim of a hit-and-run. "Blethyn shines"-Daily Telegraph (UK). 4 feature-length dramas, over 6 hrs, 4 DVDs, SDH. Mature audiences.